Variously known as Schwarmer, Anabaptists, Communitarians, Swiss Brethren, or Brethren in Christ, they called themselves Doopsgesinde, a Dutch term meaning “baptism minded” or “water minded.” Perhaps the Dutch term was the source of Doops Momber’s name. Campbell wrote the story of Doops in The Glad River, but in the process he discovered that Doops had a story of his own to tell. Campbell’s story was about three young men who lived during the middle of the twentieth century; Doops’s story is about a woman and two men who lived 400 years earlier, the story of Cecelia Geronymus, her friends, and her people, a story of fugitives on the run, baptizing each other in secret by pouring water from a dipper or by sprinkling from a saucer in someone’s attic. Doops and his friends, popular and secure, announce their baptisms in the morning paper, and insist that it be by complete immersion in an electrically heated tub. The dissimilarity is shattering to any notion of kinship; yet the connection cannot be denied—although Doops’s folks were Baptists. In Doops’s story, Cecelia died, drowned in a sack in the Amstel River. 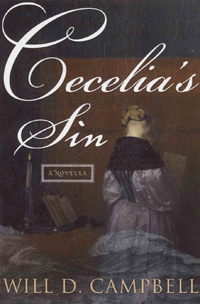 Doops left without finishing the story, but Will Campbell has filled in the gaps in Cecelia’s Sin. And in his introduction, Eric Gritsch explains how Cecelia and her people fit into the overall scheme. Because her cause failed, some might say that Cecelia died in vain; Ceclia, however, would say—together with many believers, past and present—that an act of faithfulness is our only vocation. Will Campbell, Director of the Committee of Southern Churchmen, is the author of brother to a Dragonfly and The Glad River.